How to synchronize, mix, combine or transform temporal media streams as varied as sounds, animations, melodies, videos, controls, while abstracting from their nature? Since application designers are more often artists and less often software developpers, there is a strong need for simplifying design software interface. A consistent and robust mathematical framework is being developed for the modeling of sequential and parallel aspects of temporal media; its development towards application and system design aims at providing simpler, safer and more powerful software tools for the creation of tomorrow's hierarchical, multi-scale and multi-modal pieces of interactive art. Algebra, partial order and category theory, logic, domain specific languages, specialized GUIs and application experiments in art oriented embedded systems design are the current corner stones of our approach. 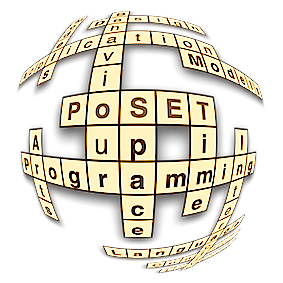 The PoSET project thus aims at gathering and developing both theoretical models and concrete applicable tools for designing, programing, experimenting and running timed reactive systems. It is also a partner of the Studio SCRIME.